The recent flood of reports, films and events have brought new currency to the issue of climate change. The Stern Review (pdf), the Intergovernmental Panel on Climate Change’s Assessment Review 4 (wikipedia), An Inconvenient Truth, and COP13 in Bali, have generated much media coverage. We should also not forget the impact of a number of natural disasters, such as Hurricane Katrina, that opened up climate change linkage debates and drew public attention. The year 2007 stands out as a golden year for climate change awareness. If you type the keywords “climate change” into Google Trends, you will see that with respect to internet search volume and news coverage the use of this term jumped significantly in 2007. We can conclude from this that people are becoming more anxious for information about the issue than they were in the past. Unfortunately, there remains a significant gap between the percentage of people with an awareness of climate change and those taking action to solve the problem. A recent study by Anthony Leiserowitz at Yale University showed that although 92% of Americans know about the issue, it remains a low priority relative to other issues and lacks urgency. 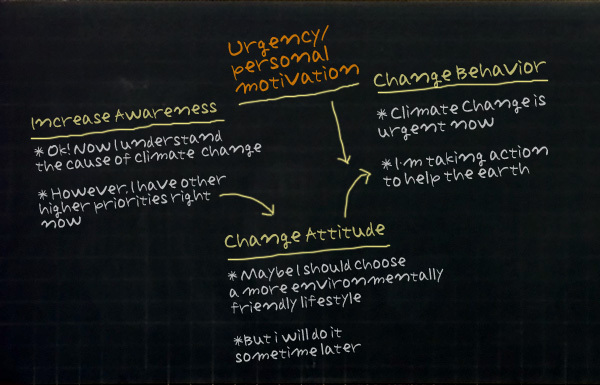 This dichotomy of high awareness and low priority is principally due to the ineffectiveness of typical climate change communication strategies. Some conventional awareness raising approaches—such as fear creation, moralizing, and information provision—are insufficient in drawing positive behavior changes from the public on climate change issues. Worse still is that some of the approaches create undesired effects, such as denial or anxiety. Therefore alternative approaches are needed to close the awareness/action gap. As the figure shows, when climate change information is imparted to an individual, awareness is created and understanding takes place. This understanding might even help to change the attitude of the individual by developing their sense of responsibility about climate change. However, a change of attitude doesn’t necessarily lead to a change of behavior towards positive action. In order to provoke behavioral change, it is necessary to create a sense of urgency or stimulate the desire to act at the personal level. Activating a personal linkage triggers the individual’s willingness to commit to the action called for in the communication campaign. Thus, in order to bridge the awareness/action gap, it is essential that communication strategies be used that are capable of drawing out personal behavior change. The Japanese Ministry of Environment’s Team Minus 6% climate change awareness campaigns have achieved much in promoting public participation in the practice of an eco friendly lifestyle. According to the team’s website, the number of registered individual Team Minus 6% participants has reached 2,302,513 and 21,795 organizations now participate. Recognizing Japan’s success, United Nations Headquarters in New York implemented a similar Cool UN campaign last summer. Team Minus 6% campaigns utilize innovative communications strategies. Some techniques used by the team, outlined below, are essential in prompting action. Make global warming ‘local’: To motivate action at a personal level, climate change communication needs to localize ‘global’ warming. For example, though climate change is a global issue, we can feel its impact at home, and we can act on it at home. Make it easy to understand – See it, feel it:The majority of climate change awareness programmes simply attempt to provide more scientific information, in more detail. But sometimes scientific information is too difficult to be fully understood by the public, rendering it useless in the push for public behavior change. In order to have an effective impact, the message sent needs to be clear, and given in a manner the audience will be able to visualize and understand. Lead by example:In forming Team Minus 6%, leadership was taken by the Prime Minister and cabinet members, showing a strong commitment from the government. This move underscored the necessity for action that further influenced the corporate sector, a sector that usually “waits and sees” the decisions and policy from the government. The Cool UN campaign shows the UN’s determination to lead the world in combating climate change problems. Addressing collective power: People often feel that their personal power is limited when dealing with global issues. Climate change communication strategies therefore need to create a sense of team work in the audience. This can be done by instilling the notion that, combined with the effort of their family, neighbours, relatives, colleagues and friends, an individual can have a larger impact. The leverage approach: A large communication campaign needs to reach a wide audience. However, this entails huge resources and effort. For its public outreach strategy, Team Minus 6% applied the “leverage approach” to create a chain of effects type of promotion scheme that borrowed the strength of others as a way to amplify potential gains. Incorporate cultural and social values: An effective message always helps the audience to relate the concept to something with which they are familiar or which has a relationship to their surroundings, society, family, etc. Applying traditional knowledge and cultural practices that help reduce CO2 emission has proved to be an effective tool to communicate climate change in Japan. Public awareness is the key to making a real difference in the fight against climate change. The innovative communication strategies used by Team Minus 6%, can be viewed as an influential model. Success is achievable when the goals of the initiative are understandable, when there is leadership by example, the addressing of collective power, use of the leverage approach and the incorporation of cultural or social values. Then the end result is that the initiative is made easy and desirable for the public to follow. Today, there is a real danger that public attention to climate change will decline as the credit crunch and economic downturn take centre stage. Certainly, the financial crisis is threatening global economic health. However, the risks stemming from climate change and depletion of the planet’s ecosystems pose a larger threat and they still need far more global effort. It is important to find win-win strategies that will help not only the economic situation but also reduce our collective carbon footprint. The use of successful communication strategies can help maintain the momentum that was building towards climate change action. Closing the awareness-action gap by Chun Knee Tan is licensed under a Creative Commons Attribution-NonCommercial-ShareAlike 3.0 Unported License. Chun Knee Tan is the UNU’s project coordinator for the Global Environment Information Centre in Tokyo. He has been involved in the earth observation field since 1997 when he was an Environmental Science graduate at University Putra Malaysia. After finishing his M.S. in GIS and Remote Sensing, he joined ESRI Malaysia as a GIS engineer. Later, he pursued his PhD in satellite oceanography at Nagasaki University in Japan and joined the United Nations University in 2006. Tan has wide research interests related to remote sensing, climate change, disaster management, and community empowerment issues. He has been actively providing satellite images, training and advice to young scientists in the Southeast Asia region. Debate: What Will It Take to Make You Change?